Firstly, we want to wish all our customers, staff and local communities a Merry Christmas and a prosperous and happy New Year! Everyone at Armstrongs from Aggregates to AMIX would like to thank our customers and communities for another excellent year. We look forward to working with existing and new customers and people in our communities in 2019 after the Festive Break. When is the festive break? The Armstrongs festive break comes into effect from Christmas Eve until January 2nd. Our staff are taking an extended break for the festive season to fill up on mince pies and Christmas dinners! There will be limited staff on site across this period so the best way to contact us would be via email. We will do our best to get back to you in a timely manner. Over the past few months you will have seen that we have improved on and increased our work in our local communities. These are foundations that we have built to have a lasting effect in our communities. We have worked closely with Bolton Sixth Form College and The University of Bolton to provide work experience opportunities to students. We have raised money for Macmillan Cancer Support. Also, we collected donations for Local food banks- including Bolton Lads and Girls Club- and so much more. We aim to continue to expand on and build new relationships with our community in the coming year. 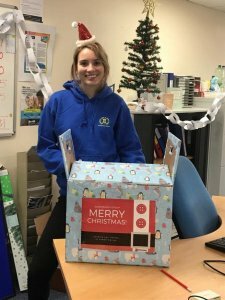 Our staff have worked tirelessly all year round to provide high quality products and services and we would like to thank them for such a brilliant year. We hope they enjoy their festive break. We could not provide the high quality products and service without them. 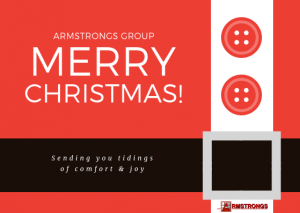 We would like to wish our entire Armstrongs family a very Merry Christmas and a Happy New Year. We look forward to your return in the New Year. If you have any queries or questions for us over the festive period you can email us on enquiries@armstrongsgroup.com and we will get back to you as soon as we can. Christmas is a time for family and the community. Over the past few months we have been investing our time and efforts heavily into our local communities. Armstrongs were first approached by the lovely people at The Media Village to take part in their Food Bank Donations drive. We first met The Media Village through the #BoltonTweetUp Twitter chat for local businesses and quickly developed a working relationship with them. We are humbled to have been approached by them to take part in this wonderful cause. The idea was a fairly simple one. A reverse advent calendar. Each day we donated one item to the box for 25 day . However we couldn’t stick to that rule and ended up donating so much more. As a result of this we ended up with two full boxes of food to donate. 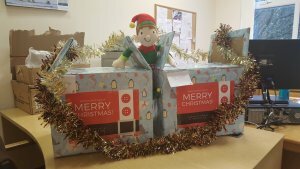 Once the boxes were wrapped one was collected by The Media Village and the other was donated to Bolton Lads and Girls Club. A few weeks ago, I was humbled to be invited to BLGC to have a look around and to discover about the great work they do for the community. I was told about their food banks, their clothing banks and their different activities we could get involved in. Last week, Andy and Dora from BLGC came in for a brew.They collected the donations box. Whilst here they told us all about the good work they are doing for local people. As a result of this we will be working closely with BLGC in the future to provide enriching activities and experiences to those who use their services. We are looking forward to working with them in our local community. You can find out more about our work in the community across our social channels. On Facebook, Twitter, LinkedIn and Instagram. We want to help you, the people who support us, get to know our business so we thought we’d answer some Armstrongs FAQs. How would a customer go about getting a quote for stone signage? To receive a quote about an idea for a stone sign, all you have to do is phone through to our sales department on 01204 668021 and press 1. Our friendly sales team will help you every step of the way. 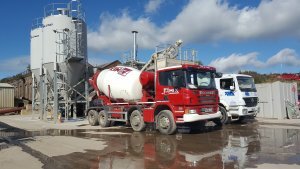 How would a customer go about getting a quote about ready mix concrete? All you need to do to receive a quick and easy quote for our ready mix concrete is to go on AMIX’s webpage and find the built in calculator which we have HERE! Who makes up Armstrongs Group? Armstrongs Aggregates Ltd and AMIX RMC make up the Armstrongs Group. AMIX became a subsidiary in 2015. However AMIX was registered as an independent company in 1993. Quarrying is the extraction of stone or other materials from the earth. Aggregate is a material which is made up of a load of fragments which are loosely packed together. Find more information about the whole aggregate process on our previous blog. This is part of our Armstrongs FAQs because people want to know the process behind the product and also what that product is they are being sold. There are a range of uses and applications for aggregate. Concrete is one of the uses of aggregate. Other uses include gabion baskets, MOT type 1 which can be used for pavements and the aggregate ballast on train tracks which are used for a number on reasons. Cement is one of the ingredients in concrete and is a powdery substance which is made by calcining lime and clay. Calcining is the part of process where the lime and clay go through a large tunnel and heated to extreme temperatures. Mixing aggregate with water and cement creates concrete. Concrete is a material which gets stronger and stronger throughout the years and the older it gets. What is the different between quarrying and mining? Mining is the process of obtaining minerals and commonly coal from a mine under ground. Whereas quarrying, is the process of extracting materials from above the ground. Blasting is also a lot more common in the quarrying industry. How many trucks do you have? At Armstrongs, we have 70 trucks which are all driven and operated by our highly skilled drivers. What different types of trucks do you have? When it comes to our trucks, we at Armstrongs use only the best to get the job done. Scania trucks are the perfect vehicles for what we do and that’s why we use them exclusively for our fleet. Our flagship truck “Mayson” is an R520 which holds a huge V8 engine and is the biggest in our fleet. Other trucks like our 8 wheeler tippers consist of different models such as the G410, P380, P400, P410, P450 and the R410. What heavy machinery do Armstrongs use? Armstrongs have a wide arsenal of powerful and amazing machines which we use everyday. To carry out our work we must use a wide range of different machines for different uses. Currently, we have a range of different excavators which we use, these include our Hitachi ZAXIS 690LCR, ZAXIS 210LC and the ZAXIS 225USLC. They all have different uses and we utilise their strengths very well in our work. For our dump trucks, we use the behemoth that is the Bell B40E-ADT. This machine is perfect for shift large heaps of stone and aggregate with its massive power and also bigger payload. The bulldozers which we use are the best-in-class for horsepower with 214 hp. We also use Screeners and washers in the process of producing our aggregates. These are huge machines which will carry loads of aggregate through them and wash the piles so that they are ready for transport. What environmental processes must we go through? There are multiple environmental processes which we must go through to make sure that everything we do here is legal and Eco-friendly. By using the link provided you can take a look at all of our certificates and policies concerning health and safety, terms of sales, quality policies and much more. How do we extract our stone? We extract our stone through the process of blasting and through manual extraction with an excavator. We search for the perfect place in our quarries where we can find the type of stone that we require for the job at hand. When we have found the suitable rock face or area and the explosives have been drilled and placed, it’s time for the blast. Blasting the stone away from the earth will then allow for us to take and use it for aggregate or cut stone. This is definitely part of our Armstrongs FAQs as people love to ask us all about how we extract our stone. Manual extraction occurs when there needs to a more delicate approach to larger pieces of stone, for that used in constructions at La Sagrada Familia or for a range of cut stone products. 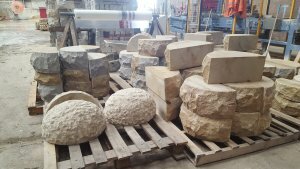 How do you produce bespoke cut stone? It all starts with a call from you. Once you have told our sales team what it is you’re looking for then our team of experts in the stone shed start to work. We select the best stone for the job and load it onto one of our saws to cut into shape. Once the saw has completed its work we hand over the stone to our excellent stone masons. Here they will complete the design whilst also hand crafting the extra details with great care. From fireplaces to benches and walling stone to logos and much more, we can create anything to your exact specification. How many quarries do you have? 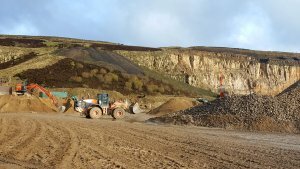 We currently operate 5 quarries across the North West and Cumbria. We have Montcliffe and Pilkington in Horwich, Brinscall in Chorley, Waddington Fell in Clitheroe and Shap in Cumbria resulting in Armstrongs having a wide span over the north west. What can your stone be used for? Anything. We produce Aggregate, Cut Stone and Concrete for a range of applications whereas our most popular product which we produce is aggregate. From foundations to full houses and all the extra furnishings- Our stone is suitable for all construction situations. Our highly skilled stone mason will take care of any needs our customers have. How long does your stone last for between extractions? This depends on demand, However we expect fifteen thousand tonnes of stone to last around two weeks before we start to run low on materials and need to extract again. What qualifications do I need to be able to work at Armstrongs Group? Another one of Armstrongs FAQs is must you have a HGV 1 and 2 license to become a Armstrongs driver. No specific qualifications are needed to work in our offices or on our site however a keen and willing attitude is always expected. Experience is preferable but not desired. Our careers are displayed here. Do you do educational trips? We more than welcome educational and scientific trips to our sites. We have a history of school trips and researchers visiting our quarries. To enquire please email us on enquiries@armstrongsgroup.com and we will do our best to accommodate you. Where in the world do we send our stone? We distribute our stone to the UK and Europe however our reach is distribution reach is global. Among the many projects we undertake we do currently ship our stone to Barcelona. The stone is used in production of the building of La Sagrada Familia. This is something we at Armstrongs are extremely proud of and love knowing we are apart of something so huge. We hope you found our Armstrongs FAQs blog helpful. Do you have anymore questions which you’d like us to answer? Then please don’t hesitate to contact us! You can follow more updates from us across our website and social platforms on Facebook, Instagram and Twitter. We will also answer Armstrongs FAQs in our comments on our social medias, so don’t be afraid to ask. 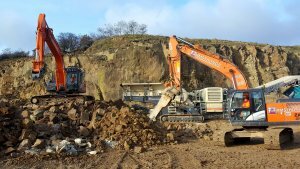 Here at Armstrongs, we have been a reliable supplier of aggregate for years. Now we think it’s time we taught you a little more about what we do, how we do it and why. 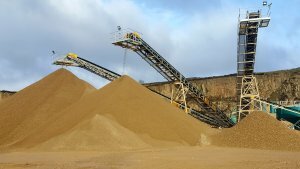 So what are aggregates and their uses? First of all, you are probably wondering what is aggregate, well this is the material which is made up of a load of fragments which are loosely packed together and used all over the world for different purposes. To acquire the perfect aggregate for the job, there are certain steps which must be followed for extraction. The first step in the process is identifying the perfect place to blast for the required stone. Once the right place has been found, holes must be drilled for the explosives. These explosives will allow us to release the stone we need for making the aggregate. Now it’s time for the blast, the almighty explosion that sends a bellowing rumble through the quarry. Last week at Montcliffe, we performed a blast that yielded 15,000 tonnes of stone; this roughly lasts around two weeks. Next, we will collect these large pieces of stone and bash them down using an excavator with a pecker tip. Doing this will allow us to then put the smaller broken down pieces of stone into the crusher machine. The crusher does exactly what it says on the tin, and crushes! This large aggregate is crushed down to various sizes which then need sorting into categories. Once through the crusher, the remains are spilled out into a pile, waiting to be transported to the Screening machine. Using an excavator and a truck, the pile of smaller aggregate is then transported to the screener, which will wash and sort the piles. These new piles will consist of various sized aggregate which will later be used for different functions. Armstrongs produce a range of aggregate sizes from 2mm and 10mm all the way to 75mm and the gabion sized aggregate 150mm. The use of the aggregates will depend on the size of the aggregate and this is why it is important to screen the aggregate. The machine which this takes place in, is a large vibrating screen box which consists of a number of various sized screens and meshes. This will separate the different sized aggregate like a sieve until they are all separated and washed. 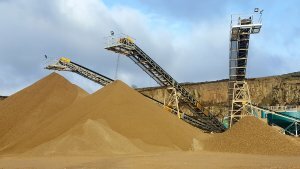 These sieves will separate the different sizes of aggregates and create different piles which will vary in sizes, ranging from larger 20mm to as fine as 2mm sand. During this screening process, the aggregate is washed and this is to remove any unwanted materials such as clay, silt and dirt which may be present. We do this simply so that there is no drying effect or impurities in the future. This could lead to cracking, and you do not want that! Armstrongs operate from 5 quarries across the North West and Cumbria which means we can keep tight control on quality of our products. We produce aggregate as there is an ever growing need for it in the world we live in today. With the constant construction of houses and other buildings throughout the world, it’s important to keep producing aggregate. It is a vital part of some construction jobs. One of the most common uses of aggregates is concrete, another material which Armstrongs Group produce. Concrete is used widely throughout the construction business. From foundations to full fledged buildings. Ready mix concrete is a large part of the construction industry and is what our subsidiary AMIX does best. Another example of aggregates and their uses are gabion baskets, which is large aggregate inside a metal mesh basket. This is a more aesthetic use of aggregate and is for more of the larger variations of aggregate. Armstrongs use a 150mm sized aggregate for gabion baskets. Gabions are used in garden purposes and also civil engineering projects as well. These gabion baskets create a sturdy structure which is perfect for coastal management. Have you ever noticed the stone which is laid between and around the tracks which trains run on? This is aggregate and it has many functions for being on train tracks. Possibly the most important function of the large and rough aggregate is to hold down the cross tie pieces of wood between the tracks, so that they do not separate. Another function of the aggregate ballast is to absorb the vibrations from the trains themselves. MOT type 1 aggregate is a sub base that is formed using recycle crushed down concrete and various sized rubble. The rubble can consist of sizes from 40mm aggregate to dust . MOT type 1 has been considered an ideal sub base for both projects large or small for a long time. Pavements are a good example of what this type of aggregate can be used for. This is why aggregates and their uses are vital to the construction industry. This is the process which we here at Armstrongs go through to make sure the you have the product you want. If you want to find out about our aggregate products which we offer and the scale which sell on, you can click HERE. You can find more updates from us across our website and on our social media channels such as Facebook, Instagram and Twitter!